Classic round green artichokes produced all summer. Big 4 - 5 foot tall plants with handsome, deeply-cut silvery leaves. Hardy to Zone 7. Bears a good crop the second season. Germinates in 1 - 3 weeks warm. Italian heirloom with purple artichokes that are taller and narrower than the green type, and stands more heat and cold. Bears the second season. Germinates in 1 - 3 weeks warm. Eruca sativa. Easily grown annual with lobed leaves. The young leaves are added to salads, soups, etc. Begin harvest in 6 weeks, and they will keep producing after cutting. The younger the leaf, the milder the flavor. Best with frequent waterings. Also called Rocket Salad. Allium schoenprasum. This perennial herb is the best-flavored and smallest member of the onion family, having slender, delicate leaves with a mild flavor. Excellent in salads, eggs, soups and for topping baked potatoes. The beautiful lavender flower heads make a colorful, tasty garnish when broken into individual florets and sprinkled on salads, in dips, and anywhere else you would use chives. Chives will grow in any well-drained soil. Keep moist. An excellent pot plant for the kitchen window, or may be sown in rows 1 1/2 feet apart, thinned to 8" apart in the rows. Harvest leaves continuously until frost. Plants will die back over winter, and reappear in spring. Every cook needs chives. USDA Germination Standard: 50%. Large juicy leaves, heat, drought and cold tolerant. Stands light frost, which improves the flavor. Produces abundantly, even in poor soil. The most popular' variety, blooms early with large flower umbels and leaves for pickling. Highly aromatic and easily grown annual. USDA Germination Standard: 60%. Miniature French type with narrow, finely-curled leaves and creamy hearts. Mild sweet flavor, excellent for baby salad greens. USDA Germination Standard: 70%. Big semi-heading type with thick, buttery green leaves. Crunchy, sweeter than the Italian varieties. Use inner leaves for salads, cook outer leaves like spinach. Heirloom French escarole, slow bolting and hardy. Organically grown. "The best we've grown, forms fat juicy bulbs even in hot weather and does not bolt! Its the only bulbing fennel we've actually been successful with. "—Ben Kamm. One week prechill helps germination. Foeniculum vulgare var. rubrum. Feathery reddish bronze foliage; a very pretty 'smoky' effect. To 4 feet. Hardy short-lived perennial. Chopped leaves nice in salads or sauces, seeds for seasoning. Allium tuberosum. Flat dark green leaves with a delicious garlic flavor. Strongly aromatic, popular in Asian cooking, chopped fine like chives. Heat and cold tolerant hardy perennial to 1 1/2 feet. Good in wet climates where garlic won't grow. Cherry-sized golden-orange fruits enclosed in papery husks. Luscious, sweet fruity taste, compared to apricots, tangerines, or pineapple. Makes wonderful pies, dessert sauces, and jelly. To harvest, wait till the fruits ripen and fall from the plant, gathering them from the ground. USDA Germination Standard: 50%. Ancient Mexican vegetable, producing an abundance of mild, spinach-like leaves, and the flower clusters are steamed, boiled, or battered and fried. Ripe seeds ground as meal. Very easily grown and very productive and delicious. Germinates in 1 - 2 weeks. Pachyrhizus erosus. Long vines produce large crispy, slightly sweet tubers. Needs a long season, but can be grown in the North if started early. Peel and slice to eat raw, or used like water chestnuts in stir-fry. Best in light soil. Beans and pods are not edible. Beta vulgaris. A type of beet usually grown for stock and poultry feed, but used as a delicious table vegetable when young and tender. Cooked, the texture is that of tender beets, but the flavor is more potato-like, with a delightful touch of sweetness. If you find ordinary beets too strong, try this kind. The roots are globe shaped or elongated, with red or yellow skin, and white or pale yellow flesh. Mangels can be grown in almost any soil, but a well-prepared rich loam is best for a heavy yield of the long kinds. Sow as early as ground can be worked, in rows 2 feet apart. Thin to 6" apart when seedlings have developed 4 leaves. Produces large thick red roots with pale yellow flesh. Leaves red veined. Very high yielding variety, excellent for table use even when mature, having almost no tough fibers. Has a succulent sweetness that lasts through a month or two of storage. Fine winter food for cattle and poultry. Avena sativa. The grower says "Got seed 30 years ago, getting rare, the one old man grower in the U.S. died years ago. A challenge to thresh as all is done by hand, but no hull so good homestead project for the dedicated."—T. Hicks. Oats have 15% protein and grow well in cool moist conditions. Great high protein feed for chickens, horses, goats, etc. An excellent addition to the sustainable homestead. Save your seed and keep this old variety going! Atriplex hortensis. Also called 'Butter Leaves' and 'Mountain Spinach'. Hardy annual succulent herbs with large, tender triangular leaves, growing 3 - 6 feet tall. Delicious as cooked greens or in salads, a good substitute for spinach during hot weather. Cultivated since the 1500's in Europe, but little known in the U.S. Salt and heat tolerant, fast growing with ample water. Succession sow, thin to 2 feet. Also grown for ornament, making handsome cut foliage, fresh or dried. Bright red, gold, green, pink, carmine, and deep purple foliage. Stunning in salads and for cooked greens, as well as cut floral ornament. Sure to be a good seller at farmer's markets. Organically grown. Heavily crumpled, thick purple leaves. Very ornamental; new salad vegetable for the restaurant trade. Developed by Shoulder to Shoulder Farm. Organically grown. 'RED ORACH'. Striking ornamental red-purple leaves and stems. Popular variety to 3 feet, growing all year except when freezing. The succulent leaves are a colorful addition to salads, or can be boiled like spinach or chard. Pretty in the flower garden. Chenopodium giganteum. Young leaves are a striking iridescent magenta-red with crystalline red powder. Long red panicles of flowers. The stem is striped red and is very strong for its light weight due to a spiral twist. Large tall annual to 6 - 8 feet. Birds are fond of the seeds, and the leaves have been used as a spinach in the Mediterranean, by South African Bantu, and here in the U.S. Tender young leaves are good in salads. Germinates best with KNO3 or GA-3. 'QUINOA'. An important high-protein (12 - 19%) grain of the Andes, with good amino acid balance and 58% starch. A staple for millions of Andeans, the development of low-elevation types is helping its spread. Seed washed in water before cooking to remove saponins which protect from pests. Hardy, easily grown annual to 4 - 6 feet, with large seedheads. The leaves, stem-tips and young flowers are excellent in salads, having a mild sweet flavor, and very succulent. Also good cooked like spinach or added to soups. Germinates in 2 weeks. Reselected from Rainbow for the brightest, most brilliant colors. Nice! Germinates in a week. 'QUINOA'. Seedheads a blend of colors from creamy-white to rose, a beautiful variety with very mild-flavored grain. Developed by Shoulder to Shoulder Farm. Large oval golden-yellow roots with green tops, and a mild sweet taste. Delicious creamed or roasted. Organically grown. Sorghum bicolor. Corn family plant grown as an important grain in many parts of the world. The stems of some are used for making molasses or syrup, while other types are grown for making brooms or as ornamentals. Seeds cooked like rice or popped, stems chewed like sugar cane. Good fodder plant. Compact thick seedheads in shades of gold, maroon, bronze, red, black, brown and cream. One of the finest ornamental mixes. Mixture of several red types, in shades from pale rose to dark burgundy. Beautiful when dried. Includes Apache Red, Tennessee Red, Hungarian Red, many of the Hadley Reds, and others. Rumex acetosa. Perennial greens with a pleasant acidic flavor. Much used in spring salads in the place of vinegar, or cooked like spinach. Makes a nice green sauce used with fish. Sow early in spring, thin to 6" apart. Ready in 60 days or so, and will continue to bear for three to five years. USDA Germination Standard: 65%. 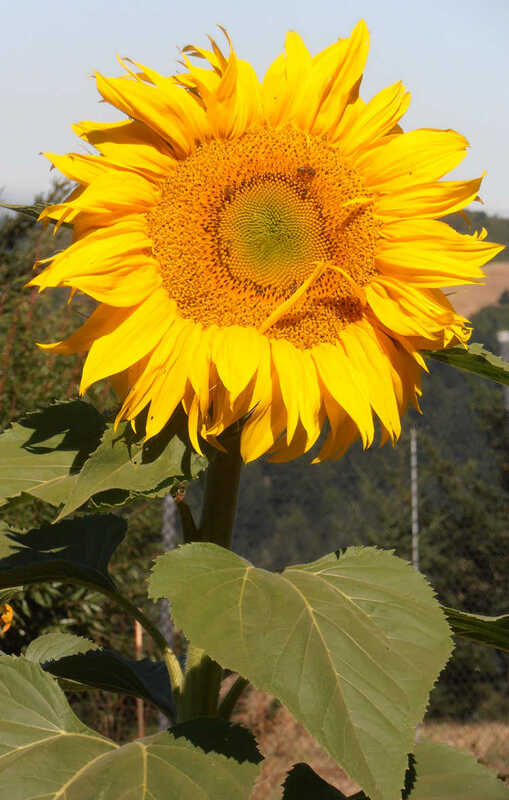 Heirloom giant sunflower grown since the 1800s. Huge yellow foot-wide flowers on 10 foot tall plants that make a good screen. Fat, grey-striped seeds are abundantly produced, a great food source for wild and domestic animals, birds, and humans. To save seeds, cut mature heads and hang to dry for 3 - 4 weeks. Kids love this one. Spinacia oleracea. Annual plant, best grown as a cool weather crop. Sow in early spring, late summer, or fall. Seed sprouts best at cool temperatures. Space 4 - 6" apart in rows 1 1/2 feet apart. Likes a rich, very moist soil. Spinach is very rich in Vitamin A and protein. Very large, smooth, thick, dark green leaves on big spreading plants. Slow bolting, for late spring sowing. A fine variety, not often available. Basella alba. Large, fast-growing tender perennial vine to 30 feet from southeast Asia. Succulent heart-shaped leaves with a mild flavor. Grown throughout the tropics, likes heat and moisture. A good hot weather spinach substitute. Grow as an annual in temperate regions, it can produce a crop in 70 days. Excellent eaten raw in salads, or used to thicken soups. Don't overcook. Can be picked often. Rich in vitamin A, vitamin C, iron, soluble fiber, and calcium. Italian variety with heavily crinkled, savoyed leaves. Known for its excellent flavor. Large plants. Does best in cool weather. Tetragonia tetragonioides. Thick, succulent triangular leaves on sprawling plants that thrive in hot weather, poor soil, and harsh conditions. Tender, delicious, and with a milder flavor and more body than regular spinach. We often find it growing on local beaches in pure sand, a wonderful wild food. Produces a continuous, abundant supply of spinach from June till frost. Pre-soak the seed overnight. USDA Germination Standard: 40%. Cucurbita species. Annuals of either trailing or bushy habit. Summer varieties have tender skin and are best eaten young. Winter types have a hard rind and are harvested when mature for storage over several months. Sow seed in late spring to early summer, in well-worked soil with plenty of manure thoroughly mixed in. Plant in hills 4 - 6 feet apart, with 6 - 8 seeds per hill. Thin to the 3 or 4 strongest plants when well established. Give full sun and plenty of water. Wet soil prevents germination. Tender, thin-skinned squashes that are eaten when young. Very good raw in salads, steamed or fried. Good for stuffing when a little larger, but if left too long will become tough and bland. Cucurbita maxima. A small variety of the Japanese pumpkin, giving round 2 - 4 pound squash with dark green skin and orange flesh. Rich nut-like flavor with a touch of sweetness, perfect for roasting, stuffing, soup, or tempura. The thin skin can be eaten when young, and makes a nice topping when peeled, diced, and fried crisp. The grower writes "Very early to set female blossoms, and as this is March I still have 9 so a reasonable keeper."—T. Hicks. An Italian favorite, the long pale green fruits can reach 6 feet, but are best when 2" thick and a foot long. Breaded, stuffed, or boiled like zucchini, Cucuzzi has a unique flavor that some prefer to any other squash. Actually an edible gourd (Lagenaria siceraria), the vines are extremely prolific and vigorous growers. Good trellised or grown on a fence. Smooth straight dark green fruits, with pale tender flesh. One of the best flavored zucchinis. Bushy, vigorous plants, early and prolific. Best harvested when 6" long or less. Sleek long golden yellow zucchini, on a bushy compact plant. Crisp and mild, a nice combination with green zucchini for farmer's markets. Also called Costata Romanesco, this is the classic Italian ribbed zucchini—deep green with distinct lighter green ridges. Very flavorful, good for grilling or picked very young with the flowers still on. Flattened golden-yellow scalloped patty-pat squash. Vigorous and prolific. Called 'winter squash' because they are grown to full maturity and stored over winter. Hard rinded, with orange or yellow flesh. Very good boiled or baked, stuffed or dried. The seeds are high in protein and oil, and are delicious salted and roasted. Fruit should be left until the vines are brown and withered, but should be harvested before frost or they will not store well. Optimum is when the stem is drying and the squash is well-matured, the rind hard and not easily broken with the thumbnail. Cut with an inch or so of stem, and cure for 10 days in the field, or indoors in a cool place if frost is likely. Undamaged, they will keep for several months if stored in a cool dry place. Dampness is bad. Cucurbita pepo. Large pale-orange squash are oval and slightly pointed, weighing up to 80 pounds. One of the finest varieties for pies, canning or freezing, with very thick, firm flesh. Heirloom from an Amish gardener in Maryland. Orange-tan skin and very thick, creamy orange flesh. Reaches 7 - 15 pounds, keeps well, great for baking. Originally from Diggers Garden Club in Australia. Cucurbita moschata. Unique heirloom from Japan, with blocky, 3 - 5 pound squash with ribs and wrinkles. Black-green skin ripens orange-brown. Firm gold flesh with distinct rich flavor. 110 days. Large fruits of true Hubbard shape, round in the middle, tapering at both ends. Skin a handsome, dusky blue-green color, warted and slightly ribbed. Thick, deep orange, fine-grained flesh. Exceptional sweet flavor. Fruits weigh 15 - 30 pounds. Stores perfectly for months. Heavy yielder. A New England favorite, for pies, baking, etc. Also called 'Peanut Pumpkin' because of the rough corky pebbles that appear over the smooth, rosy-tan skin. Unusual handsome 10 - 20 pound fruits, best harvested before the pebbles completely cover the pumpkins. Thick, sweet, moist orange flesh, wonderful for baking, frying, or soups. A best seller at farmer's markets. Brilliant orange-red skin and fine-grained sweet orange flesh. Reaches 7 - 14 pounds. Introduced by Gills Bros. seed company in 1926, great for canning and baking. Said to have been promoted for baby food. Stores well. Sprawling vines need room. Handsome banana type squash, oval slate-blue with lighter stripes, and thick golden flesh. Flavorful and one of the best table varieties, to 5 pounds. Stores well. Cucurbita pepo. Unusual ancient variety grown by the Maya. Small flattened squash, deeply ribbed and warty, in colors from green to yellow. Eaten young like summer squash, or like winter-squash when mature. Some later-date Mayan bowls resemble guicoys. Sweet and flavorful baby butternut type, with classic tan skin and butternut shape, but only 5 - 7" long. Each one is an individual serving. C. maxima. Beautiful medium-sized squash, pear-shaped to oval, with rind mottled red-orange and dark green, some all orange or all green. Flesh deep yellow, sweet and nutty flavor with no strings. Good keeper. Excellent for both eating and decoration. Probably not grown by the Lakota, but a recreation of a Native American type, introduced by Burpee in the early 1900s. In either case, pretty and tasty. Large Winter squash with a long neck and rounded end. Dark green striped skin, vivid orange flesh, mild sweet flavor. Heirloom from southern Italy, where it is used in giambotta, a classic soup, along with tomatoes, peppers, eggplant, plums, and pears. Also fried, mixed with oil, vinegar, mint, garlic, and sugar, and eaten cold. Cucurbita maxima. Slate-blue teardrop-shaped squash to 8 - 10 pounds. Sweet orange flesh becomes drier and more flavorful during winter storage. Very hard skin, making it an excellent keeper. Also called 'Pike's Peak', it may be an old Indian variety, but was introduced by Sibley and Co. in New York in 1887. "I just have to tell you how pleased I am with the "Sibley" squash I grew from your seed last season. The three last-harvested squash lasted eight (yes 8!) months with no special storage treatment except to close the heater vent on a bedroom door. It is mid-May and we are eating delicious squash soup. What a treat! Thanks! "—Bev W., Canada, 2011. Round flattened squash to 5 - 10 pounds, lightly ribbed, with powder-blue skin and orange flesh. Known for its excellent storage ability. Delicious any way you enjoy winter squash, especially nice for pies and baked goods. Magnificent, enormous butternut type, with an extremely long seedless neck. Tan skin and deep orange flesh—one of the sweetest, best tasting winter squash. High sugar content makes these delicious for baking. From 8 - 40 pounds. Gets sweeter with storage. Cucurbita maxima. Remarkable three-cornered squash with slate-grey skin and very sweet dark orange flesh. Keeps for months, and can reach 15 pounds. Distinctive French heirloom from the Locine Valley. Oval, yellow-skinned 5 - 7 pound squash. Originally from Japan, but prized in the U.S. as a low-carb substitute for spaghetti. Bake mature squash till tender, then use a fork to shred the flesh into 'spaghetti', and serve with your favorite sauce. Unusual creamy-white acorn squash with distinct flaring ribs like wings or fingers. Creamy yellow flesh with a potato-like flavor, best eaten young. Mature squash decorative. When first introduced in the 1880s it was called 'Pineapple'. Beta vulgaris var. cicla. The leaves and stems of Swiss Chard are eaten like spinach, though the flavor is milder and the whole plant more robust. Will continue to produce until frost if the outer leaves are kept harvested and flower stalks are plucked. In mild climates, chard will give for 2 or 3 years or more, though the quality diminishes. Sow seed as early as ground can be worked, in any good garden soil. Plant 1/2" deep in rows 18" apart, and thin to 8" apart when plants are well up. Harvest by cutting outer leaves at base of stem. Chard makes good poultry fodder. Mix of colorful stems in bright pink, orange, red, and yellow. Deep green crumpled leaves. Vivid color—excellent in baby salad greens. 60 days. Large, light green, crumpled leaves with broad, thick, white midribs. Fine mild flavor. Very heat tolerant and productive. Medium-green savoyed leaves with deep orange stems and a mild flavor. Good in baby salad mixes. A lovely type with deep red stems and veins, contrasting with dark green crumpled leaves. May winter over in mild climates. Very pretty, can be harvested from summer to frost. "I took my spade and went and broke the ground upon George-hill in Surrey, thereby declaring freedome to the Creation, and that the earth must be set free from the intanglements of Lords and Landlords, and that it shall become a common Treasury to all. "—Winstanley, founder of the Diggers, 1649. Lycopersicon esculentum. Tender perennial plants from South America, tomatoes have become one of the most popular garden vegetables. Tomatoes are eaten raw or cooked, in soups, stews, sauces and catsup. They are delicious stuffed, and can be fried or pickled when green. Dried tomatoes are an excellent and flavorful way of preserving a bumper crop; in jars of olive oil, they command high prices at the delicatessen. Delightful with a sprig of fresh basil. Seed is best started early indoors, about 6 weeks before the last frost. Sow in a rich, light soil, and transplant to another flat when 3" tall, spacing 4" apart. When all danger of frost has passed and ground has warmed, set plants out into a well-manured, deeply dug soil, spacing 3 - 5 feet apart. Determinant varieties stop growing and bearing fruit when they reach a certain size. They are more compact, good where space is a consideration, and they will ripen fruit all at one time, which can be an advantage if you are canning or preserving. Indeterminate varieties continue to grow and bear fruit until frost kills the plant. They grow into large plants that set fruit over the entire season for an ongoing harvest. Cage, trellis or stake them. Oval red tomatoes weighing up to 8 ounces, with thick, meaty flesh. Outstanding sweet flavor, one of the best sauce tomatoes. An Amish heirloom from Wisconsin, producing abundantly even under harsh, adverse conditions. Large beefsteak-type tomatoes are a lovely pale green, sweet and juicy, with great flavor. Heirloom from Ruby Arnold of Greenville, Tennessee. Indeterminate. Russian heirloom with rosy-purple irregularly-shaped fruits, said by some to be the "ugliest and most delicious" tomato ever grown (vying with the Purple Calabash for this). Rich flavor, sweet and tart. Small plants produce large tomatoes. Brought into circulation by the Seed Saver's Exchange. Russian variety with round 8 - 12 ounce, purple-red tomatoes with green-black shoulders, turning nearly full black in hot sun. Delicate skin and rich flavor make this one top-rated in taste tests. Originally from Krim Island in the Black Sea. Indeterminate. Pear-shaped burgundy-black 6 - 8 ounce fruit. High in sugar and acid for an intense, complex, full-bodied flavor. Good for slicing and eating sprinkled with chopped basil and olive oil. Indeterminate. Round cherry tomatoes, rich red/chestnut-brown with green streaks. Amazing flavor, described as complex, smoky, and sweet. Bred by Jeff Dawson, a cross between a black variety and Green Zebra. This is the original variety with large pink beefsteak tomatoes, famous for its rich, intense, full-bodied flavor. Amish heirloom from 1885, later obtained and maintained by Ben Quisenberry and the Seed Saver's Exchange. Potato-leaf type, indeterminate. Unusual dusky rose-purple fruits with superb flavor, sweet and juicy, reaching 12 ounces. One of the top favorite heirlooms, very productive on rather short, indeterminate vines. Thanks to Kent Whealey and the SSE for this one—their original source said it was from the Cherokee people, over 100 years old. Handsome medium to large tomatoes, deep red-brown with dark green stripes. Rich, complex flavor. Excellent for sandwiches and salads. Indeterminate. Round, smooth, medium-sized rosy-pink tomatoes with a good tangy flavor. Compact plants are very productive. Matures early, good for short-season areas. Determinate. 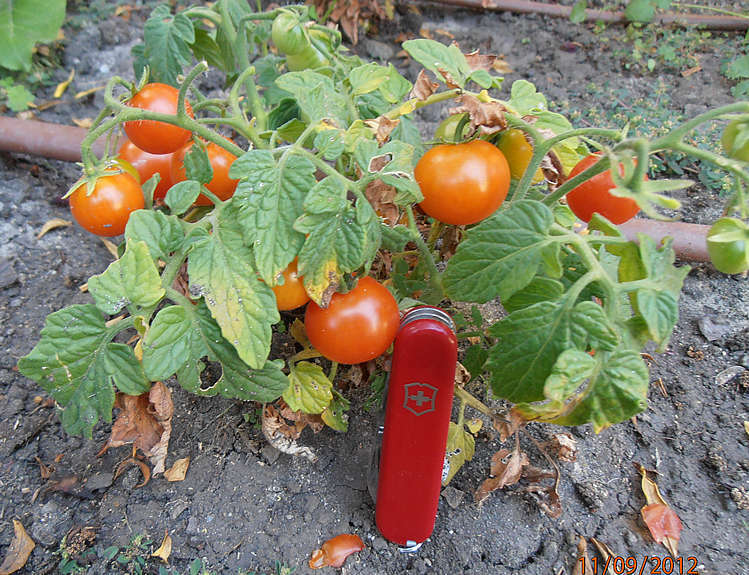 Bulgarian heirloom with large, red, slightly flattened tomatoes with a fantastic sweet-tart flavor. Heavy producer over a long season. The name means "friendship". 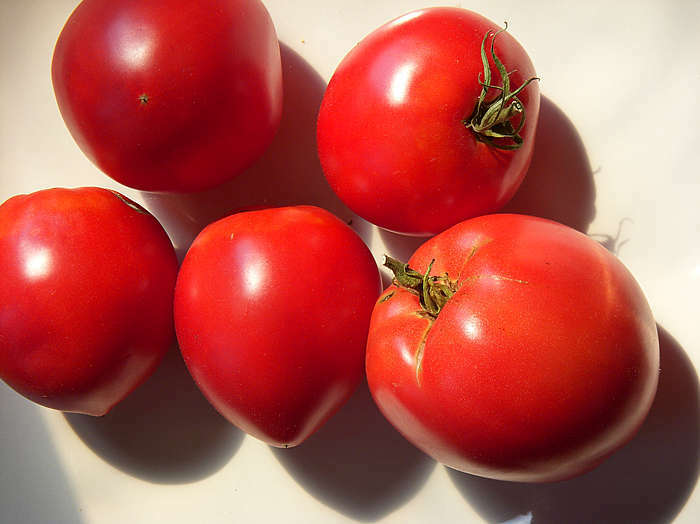 Developed as an early large-size tomato, with smooth, bright red 6 - 8 ounce fruits. Heavy yields. Good for coastal and short-season areas. Short, compact, determinate plants. Huge dark pink tomatoes, usually over 1 pound, sometimes up to 5 pounds. Excellent sweet flavor, solid and meaty. It's said that the flavor is so good that people used to make wine from them. Medium-sized pink-red heart-shaped fruit with tender skin, juicy and delicious. This rare variety was brought from Calabria Italy by Maria Mazzie Aiello in 1929, and has been grown and saved by her family for three generations. Sent to us by Maria's granddaughter Nicala Aiello. Large indeterminate plants, give support. 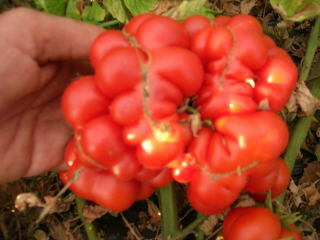 The most unusual tomato we have grown, with small red cherry tomatoes produced on very compact plants. Early and perfect for containers and short-season areas. Very tasty flavor. It came to us from Curtis Androsoff, who says: "The House Tomato are heritage seed. I have two plants that are 12 years old, producing good fruit. I cut them down for new growth each year. If you leave them, some plants grow too high in the house over winter. New growth produces more fruit. First seeds came to Canada in 1893 with my grandmother from Tbilisi Russia on an old sail ship. My people settled in Saskatchewan." The plants are high-yielding and are grown outdoors in summer, and brought in by a sunny window in winter. Here they formed dwarf compact plants less than a foot tall grown outdoors, with thick, succulent, blue-green leaves. Originally collected in the wild in eastern México. Vigorous sprawling plants produce hundreds of small deep red tomatoes. Very sweet rich flavor. Kids love eating them right from the vine. A cross between Ponderosa and Dwarf Champion by S.M. Isbell Co. in 1909, this unusual variety has large pink fruit (up to a pound), on a compact plant to 2 - 4 feet. Sweet, tart, complex—excellent flavor in a pink tomato. Sturdy, bushy plants, good in containers. Large late season tomato from southern México, deep orange-yellow with red marbling. Sweet and fruity flavor. Can reach 1 pound. Large beefsteak type, yellow-gold with red stripes. Sweet, fruity flavor. Indeterminate. Our favorite heirloom tomato, with unusual rosy-purple ruffled fruits, blushed bronze or chocolate-brown when ripe. Intense flavor. Very prolific, drought-tolerant plants; the only tomato in our trials that produced abundantly under the severely hot and dry conditions we had in 1988. A very old type; the fruits resemble tomatoes pictured in 16th century herbals. Very productive. Indeterminate. "Well, I must say that this is certainly the ugliest tomato I have ever seen in my life... On the other hand, there's the taste... the TASTE! Now I know where all of the flavor bred out of the commercial F-1 hybrids has fled to! These ugly little tomatoes are the tastiest I have ever encountered... they're wonderful raw (one friend says that they taste as if grown in wine). Fabulous simmered briefly with chopped vegetables and served on pasta, and would probably make the best tomato sauce and stewed tomatoes in the world. "—D.P., California. "These are FABULOUS—won 1st place in neighborhood in a blindfolded taste test against 4 other varieties! Strong and productive in our Texas heat. "—N.D.M., Boerne, Texas, 2/97. Medium-sized raspberry pink fruits, with full rich flavor. Heavy yields, great for canning or fresh. Originally from Russia, does well in cool coastal areas. Semi-determinate. Organically grown. Famous and now hard to find variety bred to tolerate cool nights and coastal climates. Medium-sized round red fruits with mild flavor, some are ribbed. Very productive vines. Indeterminate. Very early large red cherry tomatoes, in 6 - 8 weeks from transplanting. Developed by Beaver Lodge Research Station, Alberta Canada. Super cold-set ability, produces abundantly anywhere. Good tart flavor, great in containers. Determinate, so fruit ripens all at once, but can give two harvests, one in summer and again in fall. If you have cool nights or a short season, try this one. Bright orange, round, smooth, medium-sized tomatoes with a rich, sweet flavor. An heirloom from Maine, this one does well in northern areas. Unusual deep pink tomatoes with gold stripes, medium to large size, thick and meaty. Good sweet flavor, great for sandwiches or pizza. Bred from one of Tom Wagner's Brandy Stripe lines, introduced in 1988 by K. Sahin in the Netherlands. Potato-leaf type, indeterminate. Does best with a long hot season. 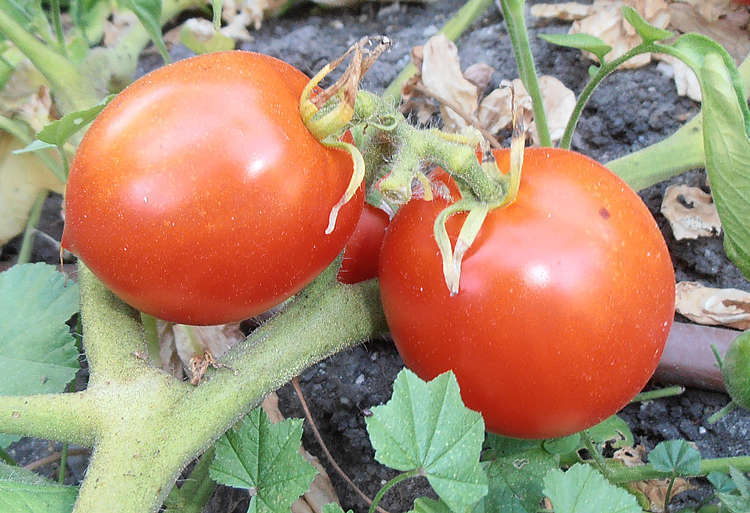 One of the strangest tomatoes you can find-some fruits are flat and ruffled, to 3" across, but others form large clusters of 10 or more cherry-size tomatoes joined together into a Siamese-twin-like bunch. Large meaty red tomatoes with fruits reaching 1 pound. Terrific for slicing and fresh eating. Also called Zapotec Ribbed, Zapotec Pink, or Enrollado, this is an old variety from the Zapotec Indians of Oaxaca, México. Large pink tomatoes are heavily ribbed, with few seeds, good for stuffing. Pleasant mild flavor. A high-altitude drought-tolerant type. Big 3 - 4 ounce apple-green fruits, turning yellow when fully ripe. Mild tart flavor, combined with fresh chiles to make salsa verde. Bushy determinate plants. Also called Mexican Husk Tomato. This husk tomato has deep purple fruits, a bit smaller and sweeter than the green type. Great for making salsa. "I strongly oppose the expropriation of genetic resources by individuals, corporations or governments for their private control and profit."—J.L. Hudson. Brassica rapa. A sweet-flavored root vegetable, turnips can be pulled young and eaten raw like radishes. Mature roots are excellent sliced raw and salted, cooked in stews, or mashed along with potatoes, or on their own. Roots store well in a cool, dry place. The tops are cooked for tasty, vitamin-rich greens. Best as a cool weather crop. Sow seed in early spring or fall in a rich soil. Plant 1" deep in rows 18" apart, and thin to 4 - 5" apart in the row. This rare turnip is the most unusual one you can find, with long tapering roots like a large carrot. Skin is ash-grey to black, white inside. Thick skin means insect resistance and long storage ability. Cooked, they are very tender, starchier than other types, with a delicate sweet flavor, more like chestnuts than turnips. Old variety from the Languedoc region of France, much loved for soups and ragouts, often fried with goose fat, or grated raw and tossed with vinaigrette. Good for slow cooking or roasting. Reselection of a Japanese heirloom, with round, flattened, bright red roots. Leaves smooth, glossy, with some scarlet or rarely bright purple stems and veins. Grown in Japan as pickling turnips, as the red skin colors the pickles a lovely pink. Plant in late summer for fall/winter harvest—not for spring sowing. From Wild Garden, organically grown. The best variety for greens. Harvest whole plant when young and tender. Boil with salt to taste. I sowed some in April, and they gave greens constantly throughout a very hot dry summer. After hot spells they got a rich, strong flavor (the way I like them), but after the cool fall rains came, they turned sweet and mild again. Cut with scissors, they give again. A real workhorse food producer. My favorite. Fast growing, with small, oval, pure white roots. Firm, fine-grained, tender, sweet and mild. Top of root grows above ground, with a green tint. A favorite in the South. About 50 days. Smooth yellow round turnips. Sweet and fine-grained, with excellent flavor. About 75 days. "My own recipe. Peel and slice (1/4") three or four medium turnips. Lightly salt and set aside (the salt brings out the juice). Chop and sauté one clove garlic in bacon drippings, cooking oil or whatever. When soft, remove garlic from pan. Bread turnip slices with Jiffy Corn Muffin Mix. Fry, one layer at a time, until golden brown on each side. (You will wish that you had fried more!)" Citrullus vulgaris. Annual tropical vine from Africa bearing melons with sweet, crisp, juicy flesh. The seeds are high in oil and are very nutritious, and can be eaten whole after roasting and salting. Sow when ground has warmed in hills about 8 feet apart, planting 6 - 10 seeds per hill. When plants are well up, thin to the strongest 3 plants in each hill. Watermelons like a light, sandy, well-manured soil, plenty of moisture, and full sun. Wet soil prevents germination. The classic watermelon, deep green-black skin, brilliant red flesh. Crisp, sweet, and juicy. Huge melons, up to 50 pounds. The king of summertime. Small round melons to 4 - 10 pounds, with light green skin with dark green stripes. Flesh is creamy white, with a wonderful flavor. Does well in cool climates, brought to Canada by Russian immigrants. Has a thin rind, so can't be shipped—great for home gardens and farmer's markets. Unique beautiful little 3 pound melons, turning deep golden yellow when ripe. Striking dark pink flesh, sweet and flavorful. Developed by Elwyn Meader at the University of New Hampshire in 1959. Matures in about 70 days from transplanting, good in short-season areas. Small round 7 - 8 pound melons with green-black rind and crisp, sweet, crimson flesh. A home garden favorite for decades. Good in short-season areas where larger melons won't mature. Intense deep orange flesh, sweet and crisp. Big oblong melons to 20 - 30 pounds, light green with dark stripes. White seeds. Incredible color and flavor. "If you're going to get old, you might as well get as old as you can get. "—Wallace Stegner.